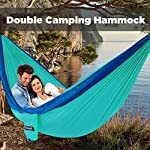 Home / Hammocks / Caylax Double hammock, high quality, Lightweight, for camping, beach, travel, etc. 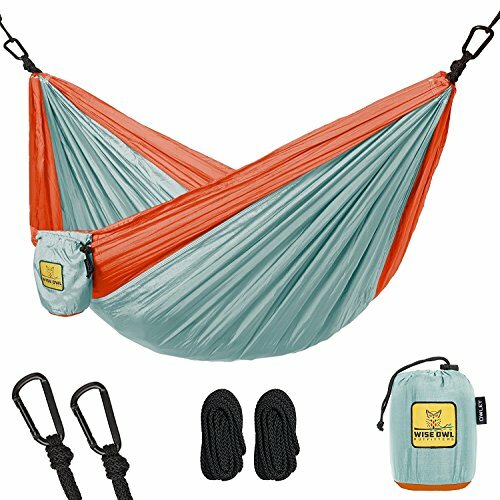 includes steel carabineers hammock straps and sleeve. MADE OF HIGH QUALITY STURDY MATERIAL – CAYLAX hammocks are known for their quality and durability. Ultra strong, breathable and fast drying nylon material are used in the manufacturing process to ensure longevity, supreme support, reliability and convenience. IDEAL PORTABLE HAMMOCK – The lightweight and compact design of the double hammock makes this easy to carry when backpacking, camping or trekking. 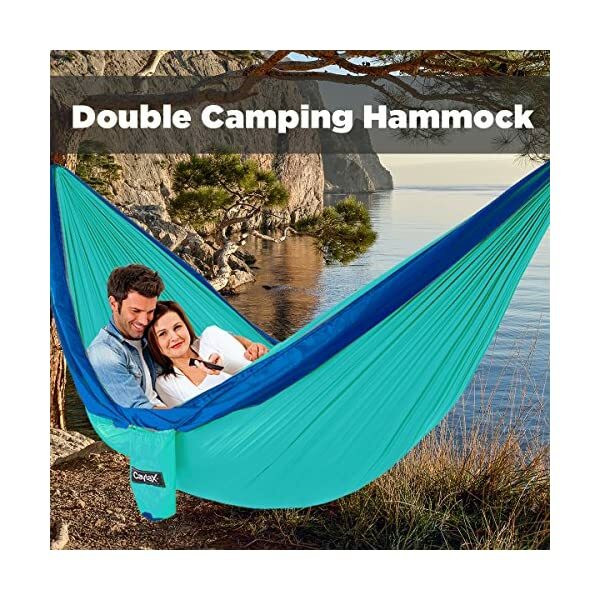 You cannot find another camping hammock as travel friendly as a CAYLAX hammock. PREMIUM USER-FRIENDLINESS – Setting up this user-friendly outdoor parachute hammock takes just a couple of seconds. Even absolute amateurs can conveniently hang the amazing double hammock anywhere they desire. The quick dry material is another preferred feature by a many outdoor adventure seekers. Tired of carrying bulky hammocks that give you back pains all through your hiking, trekking or camping excursions? Is setting up your hammock takes hours? 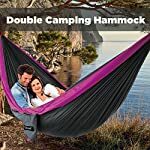 If this is the case, it’s time to switch to a superior grade CAYLAX double hammock, which is ultra user-friendly and affordable. CAYLAX is a brand known worldwide for its expertise in designing high-end hammocks. Our experienced team of designers creates the best camping hammocks for the most affordable rates out there. This outdoor hammock comes with FREE hammock straps and carabiners making your life easier. Simply set up your hammock in seconds at a beachside, backyard, or any venue where you plan to camp, hike or trek and enjoy the balmy breeze of a relaxing evening. 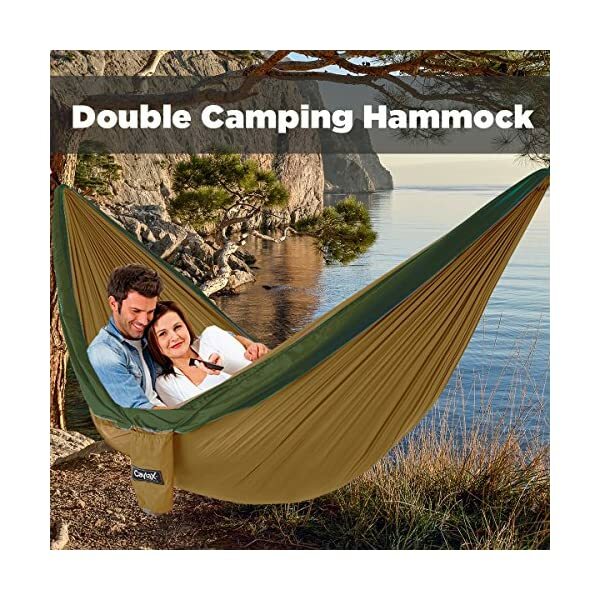 The CAYLAX camping hammock is having the capability of bearing 400 lbs allowing you to share the relaxation with one of your loved one. 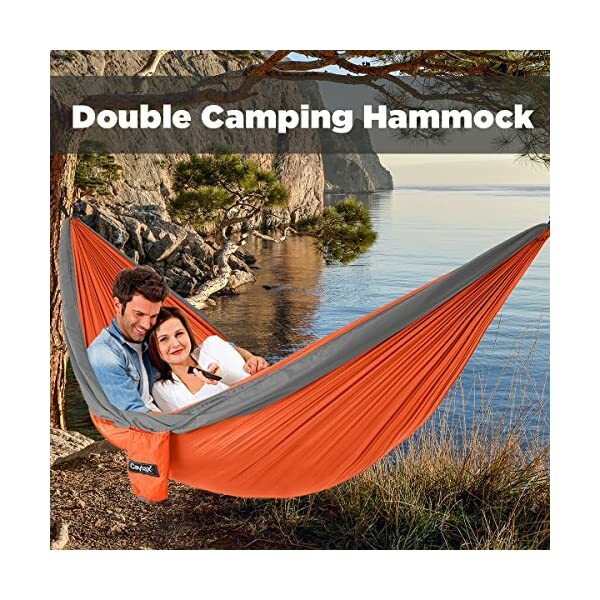 Escaping to the relaxation you desire all through your outdoor excursions has been made imaginable with the ultra compact and lightweight woven nylon material. The material also comes with a promise of durability. The quick dry property of the nylon material makes it extremely easy to dry the hammock after a rainy shower. The heavy duty interlocking stitching is another feature that improves the strength of the CAYLAX hammock. Relax comfortably outdoors reading a book or enjoying the company of a loved one, even as our lightweight hammock lull you and carry you to the zenith of relaxation. 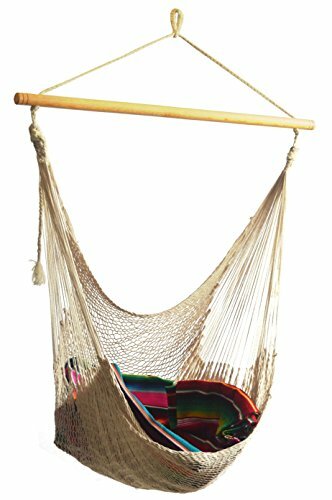 Hit the ”Add to Cart” button NOW to get this hammock delivered to your doorstep, before we run out of stock! 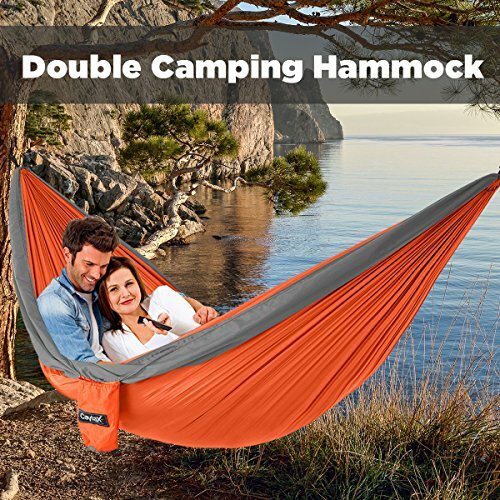 MADE OF HIGH QUALITY STURDY MATERIAL – CAYLAX hammocks are known for their quality and durability. Ultra strong, breathable and fast drying nylon material are used in the manufacturing process to ensure longevity, supreme enhance, reliability and convenience. 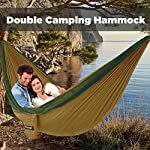 IDEAL PORTABLE HAMMOCK – The lightweight and compact design of the double hammock makes this easy to carry when backpacking, camping or trekking. You cannot find another camping hammock as go back and forth friendly as a CAYLAX hammock. PREMIUM USER-FRIENDLINESS – Setting up this user-friendly outdoor parachute hammock takes just a few seconds. Even absolute amateurs can conveniently hang the amazing double hammock anywhere they desire. The quick dry material is another preferred feature by a many outdoor adventure seekers. 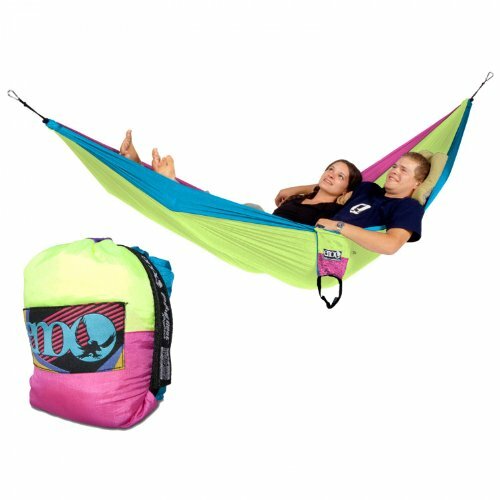 HAMMOCK STRAPS AND CARABINERS INCLUDED – For your convenience, CAYLAX hammock comes with 2 steel carabiners and 2 navy hang ropes. Both of these additional accessories come with a guarantee of strength and reliability. RELAX ANYWHERE ANYTIME! 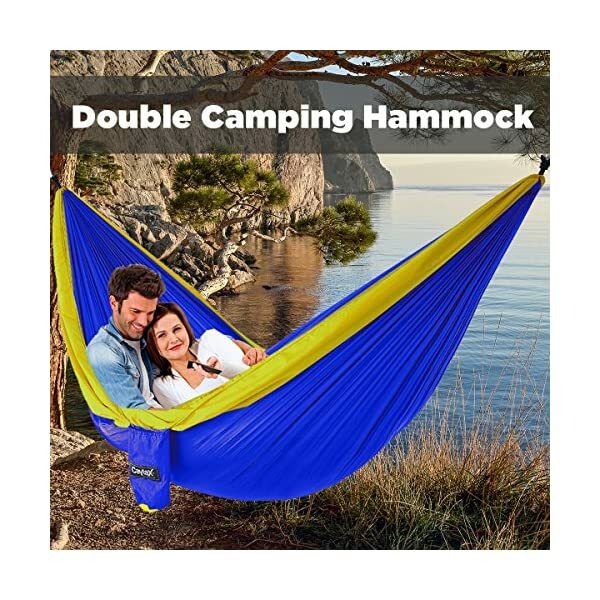 – The 300cm x 200cm hammock is the perfect relaxing enhance you would love to have on an outside excursion. The strong straps and the hammock itself supports up to 400lbs of weight, making this ideal for one or two persons. Set up this bundle of relaxation in your backyard, beach, park, or all through your hiking, trekking, camping, or backpacking picnics.